Every woman deserves a night out to relax with her best friends and enjoy a few drinks. Whether the celebration is in behalf of a bachelorette or simply a much-needed ladies night out, you'll most likely be visiting some of the Las Vegas hot spots, including dayclubs, nightclubs, and pool parties. Instead of standing in the hot sun or busy dance floor, grab a table and have the bottles come to you. No, this special service is not just for the high rollers like Britney Spears and Paris Hilton. Las Vegas bottle service is not out-of-reach – it's just about knowing exactly what it is and how to go about getting it. Ladies, let's begin with the most basic question. What exactly is bottle service? In general terms, bottle service is an arrangement where instead of waiting in long lines in front of a crowded bar and fighting loads of people to order your drinks, the venue provides you and your party a private table or booth. Once you have purchased bottles of your choice of alcohol accompanied by ice, mixers, and condiments, your bottles are served table-side by your personal waitress. Simply sit down with your girls and enjoy VIP service at some of Vegas' all-around best nightclubs. This situation sounds ideal, but how much is this really going to cost? 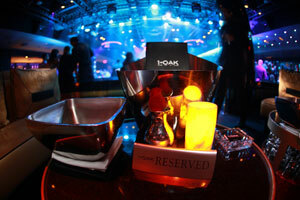 There is no set cost as the price for bottle service ranges, depending on the club and night you visit. In most cases, bottle service will be cheaper if you visit the club on a Tuesday night compared to a weekend visit. The price for a bottle service of regular vodka, such as Absolut, begins at $350 for a 750ml bottle and can go upwards to $475 at some of Las Vegas' most popular clubs. Premium brands such as Grey Goose and Belvedere can cost even more. For bottle service, vintage champagne and various specialty drinks can also be pricy. Of course, tax and a 20% gratuity will be added automatically to your bill in most Las Vegas nightclubs. If you've been doing the math, bottle service may seem like a bargain. There are six ladies in your party – so six divided by $350 is only $60 per person, right? Wrong. Most Las Vegas nightclubs require that your party purchase at least one bottle for every three to four ladies in your group. Some nightclubs require a two-bottle minimum per private table, regardless of your party size. Prices can increase on busy weekends, holidays, and for special events, such as Match Madness and Halloween. There are a few other fees that you should take into consideration before jumping into bottle service. The "table fee" is a tip for the club's VIP Host. You know - the person that makes it all happen for your group. Table fees can range from $100 up to thousands of dollars. While this may seem like a lot of money, you have to think of all the great VIP services you'll be getting along with your bottle service. Your group will receive an all-exclusive table or booth for the night and have access to areas of the club designed just for VIP guests like you. Your group will also receive your own private wait staff and access to the hottest people in the club. Think hot celebrities and athletes. Bottle service is not something that you should even attempt to handle on your own. Ladies, leave this service in the hands of the professionals. Bachelorette Vegas has the connections and deals for a super smooth transaction and a visit to the club of your choice. Of course, you'll want to book your bottle service ahead of time to ensure you get to visit Vegas the night of your choice. In most cases, you'll be planning on spending the entire night at just one or two spots. You'll want to get the most for your money and have the time of your life, and this is completely possible without moving from club to club. If need be, hit up a few different clubs earlier in the night and get back to your bottle service by 11PM. Want to make that time a little later? No problem. Bachelorette Vegas will work with your schedule to suit your group better. Consider how much your group of BFFs is likely to drink over the course of the evening. If you're the type who just likes the occasional cocktail then stick with a couple bottles split between the ladies. Conversely, if you're the type of girls who can smash back $12 cocktails at the bar, bottle service will work out better for about the same amount of money but with many more benefits. Factor in that you won't have to get through the crowded nightclub to stand in line at the bar for drinks, nor fight for the bartender's attention. Bachelorette Vegas is all knowingly about each nightclub's bottle service requirements and will help your group select the best service for your drinking needs. Bachelorette Vegas offers you a chance to enjoy the party without having to struggle for seats or glasses throughout the night. Feel like the VIP that you ladies are by indulging in the amazing party experience right in front of you. Picture it – you walk into the nightclub of your choice and your party is directed to an exclusive table just for you and your girls. Your own personal waitress is waiting to supply your group with plenty of alcohol and VIP amenities. Sound good? This situation is not out of your means. Bachelorette Vegas is your one-stop-shop for the best Las Vegas bottle service and club VIP entry. You're only going to get married once (hopefully!) and you want your bachelorette party to be a memorable one. Instead of bar hopping throughout the night, settle down with a few bottles of your favorite alcohol and your favorite ladies and treat yourselves to a dream night when you're the center of attention and everyone caters to you. Bachelorette Vegas has the connections to secure your bottle service in Las Vegas at a budget you can afford. Contact us today to experience a party of a lifetime.